This Saturday we went to the Teylers museum in Haarlem to visit the exposition: " Een zee vol meerminen", a sea full of mermaids, which traces the fantastic creatures through history, cultures and folk art across the World. It shows how they passed from the realms of sailor tales and mythology, to the object of scientific treaties and then back to fairy tales. It is not a secret that I love mermaids, they might be my favorite mythological creature. In Indonesia, if you go to the beach, you shouldn't wear anything green, it's the mermaids' favorite color and you might make them angry and jealous. In Congo, mermaids have been only recently introduced and they are used as a slogan and warning against the moral decadence they associate with western values and greediness. We took our little friends, but were heartbroken to disappoint them, as they somehow thought they would see a real mermaid. We had to break the news and tell them that mermaids in fact do not exist outside people's minds and sailor's dreams, and that there was certainly not a live mermaid at the museum. At least there was a model manatee. 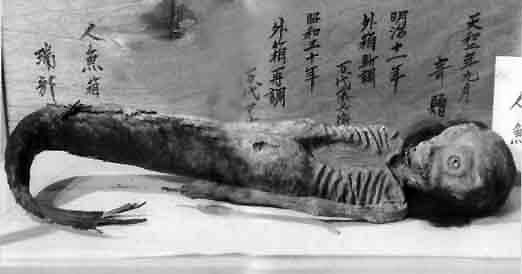 And a fake Japanese mermaid skeleton made up of a dissected fish and an ape. And they could sit and watch mermaid movies for a while. What is your favorite mythological creature? I'm not sure I've ever thought about mythical creatures in any depth before, but mermaids are definitely mysterious and alluring. I always had something for mermaids, and I am a big fan of the Hans Christian Andersen story, there is so much depth and meaning to it. Oh I have seen it, and they were also showing it at the exposition. I also read that some people were not happy it was been shown on Animal Planet because it is done in such a realistic way that if you don't pay attention at the disclaimers, you end up thinking it is real. And peple think it was a hoax, or an attempt to delude people. Oh how lucky, I have always dreamt of living by the sea (and now I do, except it is so cold and windy at the beach that I often forget it's there). Luxembourg has a mermaid in the story of it's founding! Her name is Melusina and legend has it she returns every so often... maybe you'll see her when you visit?! Oh I absolutely want to see that mermaid, and Melusina sounds right out of a fairy tale ! Mermaids are pure, unadulterated magic. When I saw a poster about the exposition, I knew we were going to have to go.